What do I say about this book? It was amazing, sad, heart breaking, heart warming and sweet....and it had me bawling my eyes out. This is one of those books where you know from the minute you start reading that it's going to be an emotional roller coaster, but you still read it anyway and put yourself through that torture because the actual story is just so very beautiful. 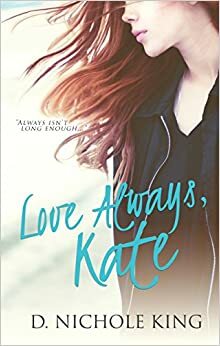 The main characters in this story, Damian and Kate, have been through so much, yet they were strong enough to continue fighting and trying to live their lives the best they could, especially Kate. There were a lot of depth in the characters and their stories will make your heart ache for them and want to gather them up in a big bear hug. I really loved Kate. Her actions and choices were realistic, and she wasn't afraid to admit how she felt about everything. Despite everything she has been through, she is still full of hope. I loved her strength and will to keep fighting, her determination to help Damian, and her belief in him. She has officially become one of my favorite characters of all time! As for Damian...I really just want to give him a nice warm hug. He has lost so much, and still struggles with his loss. He wasn't just this perfect boy who swept Kate off her feet, or your typical prince or knight in shining armor. He had a lot of problems that he needed to work out and he made mistakes. He made a lot of stupid decisions in my opinion, especially when it came to dealing with his grief, but those things just further brought him to life and made him seem like a real person instead of just a character. This story was written very beautifully, and Ms. King has done a wonderful job of bringing the characters to life. The only thing that I sometimes had a problem with was that at certain times the story felt kind of slow moving, but otherwise I loved every second of this book! I am warning you though, this book isn't all light and happy and you will most definitely be needing a box of tissues while reading it! And now that you have you finished reading this review, I highly recommend that you go right away and get this book for yourself!